Being a big believer that limitations are key to creativity, in particular with music and the recording of it, MS Paint presented exactly that…limitations. I used it to create family Christmas cards, cassette covers for bands I was in (yes that’s right, cassettes!) and of course, footy logos. Now this below work took a long time, a steady hand and quite an extensive reliance upon the zoom function. While Essendon’s rather simple style presented little problems, the Richmond logo was far more difficult, which can be seen by the fact that I merely put RFC at the top upon completion of the Tiger. I belive it was about 2001, and the phasing out of the classic logo shield shape was underway, with just a few clubs hanging onto that classic design. The choice of background colour was I believe influenced by the seats in the Southern Stand behind the Punt Road end goals with the same or similar colours. It was, of course, also a prominent colour at the time. That’s still no excuse though. Only a few of these designs remain, and in another 10 years the current logos will most likely face the same predicament. Whilst this was not the height of logo brilliance (1980’s in my opinion!) it’s still a nice little time capsule. 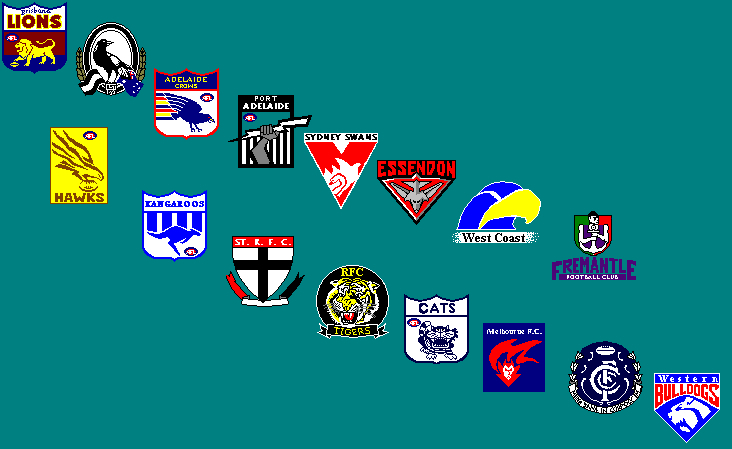 This entry was posted in Boots Happy Snaps, Musings and tagged 1990's, 2000's, Adelaide, afl, art, Brisbane, Carlton, Collingwood, Footy, fremantle, Geelong, Hawthorn, logos, Melbourne, MSpaint, North Melbourne, pixels, Port adelaide, Richmond, sheild, sporting logos, st.kilda, Sydney, West Coast, Western Bulldogs by theholyboot. Bookmark the permalink.